I completed the painting as a gift to the greatest fishing buddy a guy could ever have. One of our favorite places to fish is the Milwaukee River for steelhead. This is one of the most incredible fish to catch (when you catch one). They are not called the fish of a thousand casts for nothing! 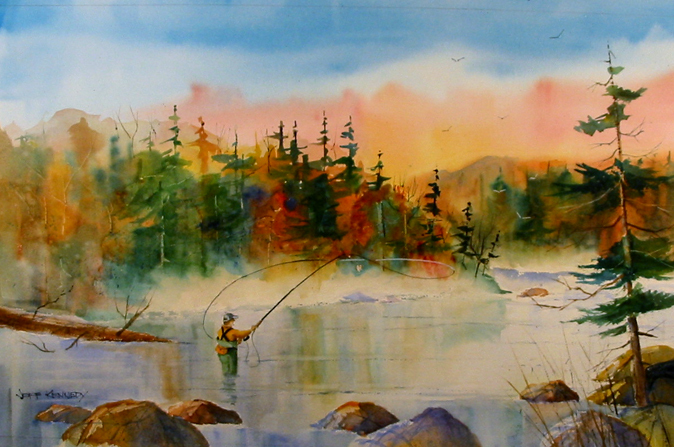 I wanted to create a morning Fall scene which is usually one of the most beautiful times on the water. I over did the reds in this painting a bit. The fisherman is also a bit stiff, not loose enough. This is something I really need to work on.